You’ve seen commercials from fine jewelry chains for years. By now you know that “every kiss begins with (the letter that follows J and precedes L in the alphabet)” and that “he went to (you all know the name, it starts with “J”),” but these chain store recipes for romance are all cookie cutter and at the end of the day he probably shouldn’t have begun the kiss with or gone to…you know who. Independent jewelers may not have the large advertising that the chain brands do, but those chains don’t hold a candle to the benefits an independent offers. When you go to an independent jeweler like Hamilton, the quality of the piece you design and/or purchase will be unique. A person shopping for an engagement ring will walk into a chain store and walk out with a ring hundreds or thousands of others have purchased. 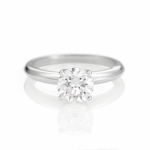 From precious metal to setting and stone, you can choose and control the quality of the piece from its inception to finished product with an independent jeweler, walking away with a ring that is one of a kind. Furthermore, an independent jeweler will be far more passionate and knowledgeable about their products than someone working in a chain, giving you quality expert advice with no tricks involved. 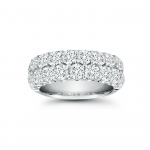 Independent jewelers respect your budget more than chain stores will. Because they are passionate about their skill and career, independent jewelers work with you to make a piece you feel confident buying and proud to give, while chains just try to upsell for commission. Independents will also be more flexible in arranging a payment plan that fits your financial needs. Premium prices mean quality, not brand name with an independent. When you purchase from a chain, no matter how reputable, you are going to pay more for a diamond of the same grading as one from an independent simply because the brand name is stamped on the inside. An independent jeweler can have exclusive pieces, but the gimmick of making money for a name isn’t a practice that will be used. Buying from an independent jeweler helps the local economy. Independent jewelers are often owned by people part of your home community. Supporting their businesses not only means that you walk out with a unique piece of jewelry, but that you are keeping funds local instead of throwing that money into a corporation’s bank account. Walking into a chain store, you are viewed as a commission, but to an independent jeweler you are someone. Jewelers aren’t just selling their wares; they are selling their craft and art, which means they have a personal stake in each piece. They will educate their buyers and work with them to create something truly special, always knowledgeable with honesty upfront. 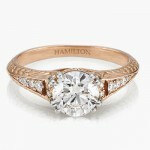 There is a reason (or many) you should choose Hamilton as your preferred jewelry source!